Few years back, a friend of mine made these for us and we all loved it. I have tried few store bought versions but I prefer the home-made ones. By making at home, you can add any type of vegetables you want and adjust flavor according to your taste. She gave me the recipes for the sauces but other than that, there is really no fixed recipe on variety of ingredients you choose. You can add as much or as little as you like. In a bowl, combine chicken, 2 tablespoons of sweet chili sauce and 2 cloves of crushed garlic. Heat a skillet over medium heat and spray with some oil. Panfry the chicken pieces for few minutes per side until lightly browned and cooked through. Transfer to a plate and let it cool. Once it is cool, slice it into small strips. In a separate bowl, combine shrimp with remaining sweet chili sauce and garlic. Wipe the same skillet and spray it with some more oil. Heat over high heat and add shrimp. Sauté on high heat for few minutes until cooked through. Transfer to a plate and let it cool. Once it is cool, split the shrimp in half horizontally. Fill a large bowl or wide opening pot with few inches of hot tap water. 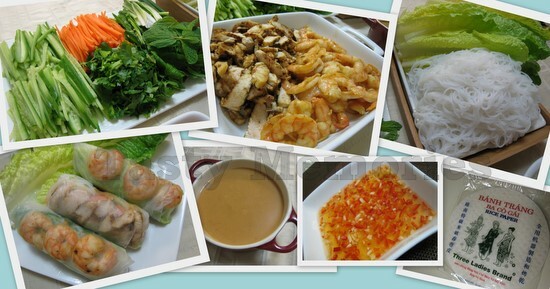 Place vegetables, noodle, chicken and shrimps to your preference in bottom 2/3 of the rice paper. Fold the bottom over, fold in the sides and roll to form a tight spring roll. Dip with peanut sauce or Spring roll dipping sauce. Note: I sometimes like to add the peanut sauce and Asian Chili Garlic Sauce while wrapping the spring rolls. Or, sometimes, I leave out all the sauces while wrapping and later dip it with Spring roll dipping sauce while eating. In a microwave safe bowl, combine all ingredients for Peanut sauce with 1/2 cup of chicken stock and microwave on high for 1 minute. Add the remaining 1/4 cup of chicken stock and stir well to combine. Microwave for 1 more minute and mix it well until it is smooth and creamy. Adjust according to taste and desired sauce consistency. Note: Sauce will get thicker once cool. Combine all ingredients in a bowl and stir well till sugar is dissolved. Adjust according to taste and serve. I will try the new Spring Roll Dipping sauce next time I make them.